HomeNew ArrivalsA Unique Opportunity to Own The Complete Library of the Presidents by Easton Press. New to our catalog this week. 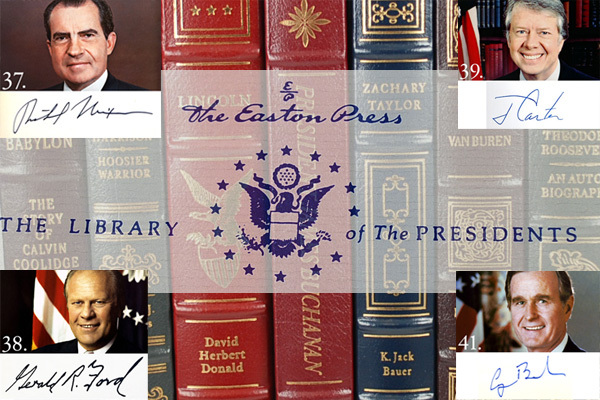 A rare chance to own the ultimate leather bound library of the Presidents. Each volume has been published by Easton Press and includes all the special heirloom features you have come to expect from the high end publisher. 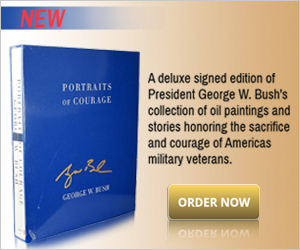 Included in this collection are 4 volumes signed by the presidents. The Easton Press, Norwalk, CT. A complete set of 82 volumes. Each volume in this series is from the Library of the Presidents and is copyrighted 1983 through 1994. Four of the volumes have been personally signed by a president. A complete limited edition collector’s set. All eighty-two volumes are in very fine condition, with a few still sealed in the original shrink-wrap. Each edition features full genuine leather with covered boards, raised bands on the spines, gilt text and decorations stamped in the compartments, and with gilt tool work on both the front and rear boards. The end papers are silk with matching silk placement ribbons sewn-in at the head of the spine. All three edges of the text blocks are gilt. Sizes vary from small octavo to quarto. See full description and photos. Eisenhower by Stephen E. Ambrose Vol. 2.